For most young adults, coming of age feels like a fight against stasis. As your body, emotions and perspective rapidly change from month to month, the world often feels too still and too staid to support your new, unruly self-in-progress. 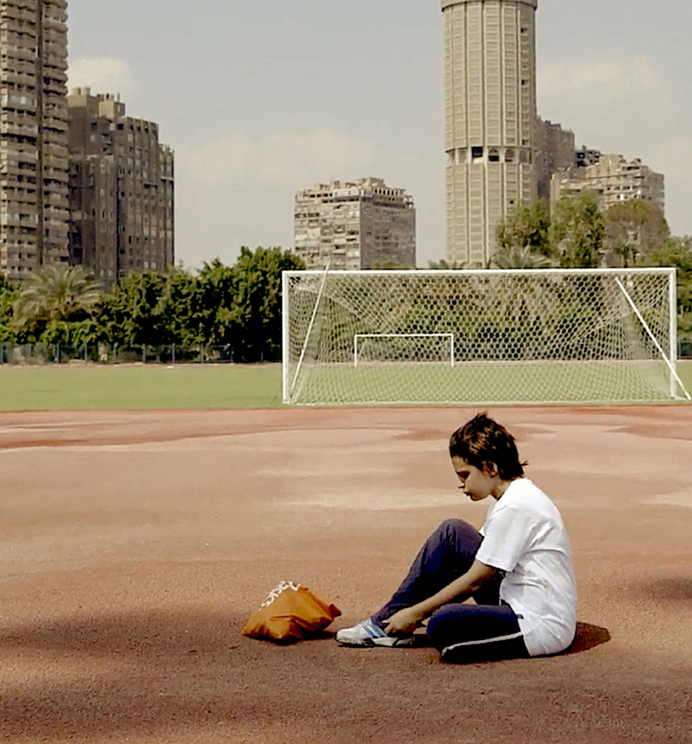 For the eponymous subject of Mohamed Siam's tight, perceptive documentary "Amal," however, the dynamic is rather different and more disorienting: As her adolescence is irrevocably shaped by the Egyptian Revolution of 2011, her personal growth and her country's violent upheaval complement each other in their turbulence. Checking in annually on Amal's unpredictable progress over five tough years, Siam's bittersweet film elegantly maintains its dual personal and political narrative without undue contrivance. The engrossing, quietly upsetting result should travel widely - as befits its multinational provenance - on the festival circuit following its prominent premiere as this year's IDFA opener. Meanwhile, the multi-platform distribution appeal of a film that touches intersectionally on topical matters of gender, political and religious identity is clear. "You think my hostility comes from nowhere?" asks the 15-year-old Amal, brazenly addressing a heavy-handed authority figure, when we first meet her in Siam's film. In the case of many angsty, snappish kids her age, the answer would probably be yes, with some blame reserved for fizzing hormones. Amal, however, has seen and endured things most teens have not. The year is 2012, and she's still smarting from her direct involvement in the previous year's Tahrir Square demonstrations against President Mubarak's illiberal regime, which saw her beaten and dragged across the ground by policemen. She's also mourning the recent death of her boyfriend, killed in the 2012 Port Said Stadium riot; her father, too, has been wrenchingly and prematurely lost to her. Such preternatural pain has made Amal hostile, yes, but it's also made her sure and sharp in her left-wing political convictions: woke, to dip into millennial-speak, though in a battle-worn rather than performative sense. Styling herself as a tomboy to best fit into the male-dominated realm of Egypt's young revolutionaries - "Sit-ins are not for girls... someone will harass you," she is warned - she stridently tells off her elders for their opposing political persuasions. "If you vote for a military candidate, I'm going to disown you," she chides her mother, a military prosecutor of a more centrist persuasion, in a loaded exchange that may well resonate with audiences far beyond Egypt: one is reminded of the polarized politics currently dividing families in Trump's America. Where "Amal" particularly succeeds is in identifying what's both peculiar and entirely universal about its young subject's politicization: Her liberalism may have been born in extreme circumstances, but her arguments with her mother are still tinged with the unsullied righteousness of generation upon generation of teens who speak as if they're the first to so purely hold their right-on beliefs. Siam (who acts as his own cinematographer, often working in frank, illuminating close-up) is infectiously impressed by his resilient, charismatic protagonist, but is witty and knowing enough to show the audience how she - like every 15-year-old in the history of ever - can be a bit of a pill. By the time she's 17, she's accepted a degree of compromise, and not necessarily for the better. She's acquired a feminine, lipgloss-lacquered look and a misogynistic boyfriend who expects her to put marriage ahead of university; her more dogmatic political side has been muted, if not defeated. A year later, she's a different woman once more: modestly hijab-clad and dedicated to her studies, though as the film swiftly catches up to the present day, the audience can grimly sense the scope of the future narrowing for this bright, promising girl. Intercutting this timeline with poignant home-video footage from Amal's early, cheerier childhood, Véronique Lagoarde-Ségot's quick, fluid editing deftly captures the sheer, neck-jerking speed of adolescent evolution: "Amal" plays almost as a time-bound thriller as we wait and hope for Amal to find herself before getting fixed in place in adulthood. Yet the pile-up of social and political injustices in contemporary Egypt chip away at her ambition and resolve, so much so that she even considers joining the police force that once abused her so brutally, with a half-hearted notion to change things from within. "I don't know if it's better to be part of the system or remain forever an outcast," she says at 18 - again, a quote that could broadly describe the coming-of-age experience from any angle. "Amal" isn't without qualified notes of hope, but what's most poignant about Siam's film is that the older its heroine gets, the further she drifts from an answer to that question.